Take the stems and seeds out of the chiles and break the flesh into smaller pieces. Place in a bowl and pour boiling water over them. Allow to rest about a half hour. If you want it to be spicy, keep some or even all of the seeds in. In a blender, mix the roasted red pepper, garlic, spices, lemon juice and oil to a smooth puree. Strain the chiles and add to the blender. Mix until mostly smooth. Cut the bread into rounds. Toast on both sides with a slight brushing of olive oil. Top the toasted bread rounds with a smear of harissa and some very thin slices of the steak. Sprinkle with fresh herbs if you have them, otherwise you can use some more dried oregano. Serve. Every year on New Years, I like to make steak and roasted red pepper crostini to bring to whatever party I am attending. It's a classy appetizer that's simple to make and really impresses people. This year I wanted to switch it up a little, so I decided to experiment with a North African chile paste called harissa. I thought it would be perfect for a twist on the dish, but still be somewhat similar for those expecting my old standby. Flavor-wise, this version knocked it out of the park! The paste had tons of flavor and really matched with the steak and bread. To be honest, I had never even tried harissa before, but I have always wanted to make it. I looked up a ton of recipes (It is made differently depending on the region) and stayed true to the basis of harissa, but modified a few things to pair well with the crostini and give my friends some more familiar flavors. This dish is a real winner and would go over well at any New Years Eve party. Just make sure the person you plan on kissing at midnight also has one--there is a decent hit of raw garlic! 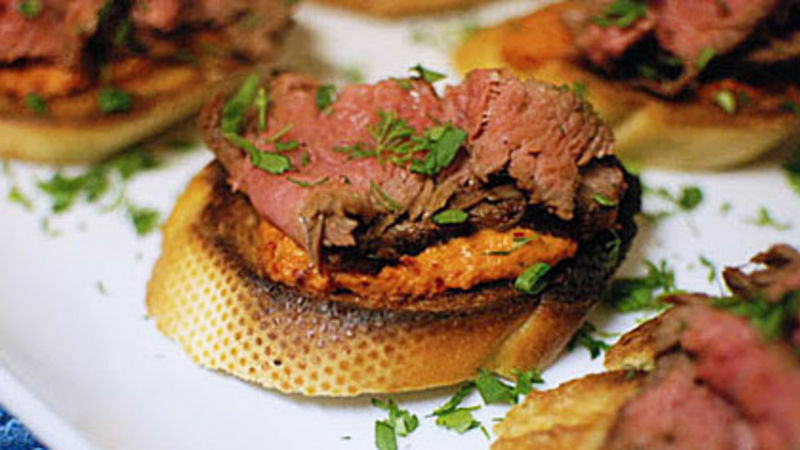 Here's the full Steak and Harissa Crostini recipe. Chiles soaking in hot water to soften. Then strained. Mine were hot because my friends like the heat, but if you want to make this paste mild, be sure to take out all the seeds. The chiles in the blender with a roasted red pepper, some oil, lemon juice, garlic, caraway, coriander, and oregano. The finished paste. It’s that easy! After the bread is toasted lightly on both sides, spread the harissa on. The recipe I posted calls for 1.5 lbs of medium rare steak. For mine, I used a flank steak! Here it is in a quick marinade of garlic, Worcestershire, lime juice, oil, molasses, paprika, and salt. After a half hour, I threw it on the grill—after shoveling it out of the snow! Slice very thin against the grain to make the pieces perfectly tender. After assembling everything I sprinkled on some fresh herbs I had in the fridge, just to make it look extra classy. I just happened to have leftover dill and parsley, so that’s what went on! If you don’t have these, you can use some dried oregano. Very tasty! Crunch from the bread, meltingly tender steak, and a flavorful kick from the harissa. A perfect bite every time. Dan Whalen thinks harissa is the new sriracha. Check out his blog at The Food in My Beard; check Dan’s Tablespoon profile often to try his recipes with creative international spins!